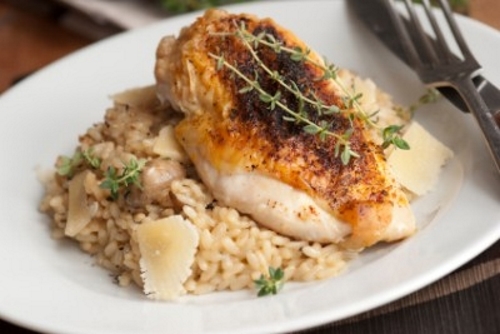 This Broiled Chicken with Parmesan Risotto is just delicious. The combination of chicken with Parmesan is always a tasty idea. Combining chicken with a nice creamy Parmesan risotto is just ingenious. Broiling the chicken will just take minutes. The best part of this Broiled Chicken with Parmesan Risotto recipe is the Parmesan that’s shaved over the top. It’s just plain delicious. Prepare the chicken for the broiler. Season the chicken on both sides with the salt, pepper, oregano, basil, thyme and rosemary. Place the chicken on top of a broiling pan skin side down. In a medium size pan, heat the broth to a simmer. In a larger pot saute the shallots and garlic over medium heat in the olive oil for 2 to 3 minutes. Add the rice and stir until the rice is slightly browned. Stir in the wine until it is absorbed by the rice. Add the 1 cup of broth and stir until all the broth is absorbed. Turn on the broiler to low and broil the chicken around 6 inches away from the flame for about 5 minutes. Turn the chicken skin side up and broil another 4 to 5 minutes. Finish the risotto by stirring in the butter, parmesan cheese and parsley. Separate the risotto onto 4 plates and shave some extra parmesan on top. Top with a chicken breast and your ready to serve. This Broiled Chicken dish serves 4 people.